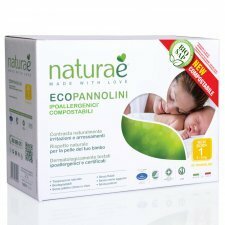 Made with natural raw materials: European Tropical forests PEFC, Super-absorbent BIO SAP of vegetable origin, PLA starch fibers, Bio breathable biofilm. 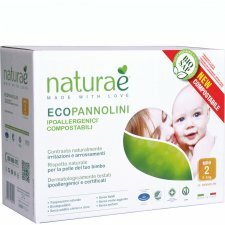 The materials in direct contact with the skin are of vegetable origin, without chemical additives, without chlorine, without phthalates, without perfumes and inks. 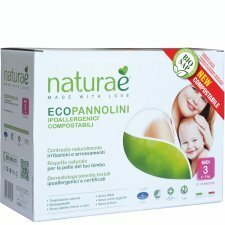 Dermatologically tested by the University of Ferrara, they are hypoallergenic and non-toxic, naturally counteract irritation and redness, favoring perspiration and eliminating the tendency to accumulate heat so as to keep the skin fresh. 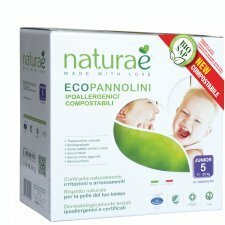 Diapers Naturaè are made with natural raw materials such as starches or vegetable oils from renewable resources. 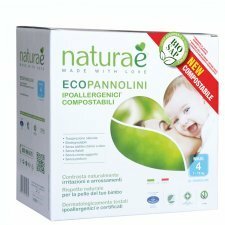 Compostability has been certified by external bodies by overcoming four tests (biodegradability, disintegration, ecotoxicity, absence of heavy metals) as required by UNI EN 13432: 2002. They are produced in a plant with low environmental impact technologies, with low energy consumption and low CO2 emissions. CERTIFICATIONS: CERTIQUALITY, NORDIC ECO LABEL (SWAN), VEGAN OK, DERMATOLOGICALLY TESTED.